Delicate three stone engagement ring with total diamond carat weight of 0.50. Stunning 0.50TW diamond engagement set in white gold. Diamond engagement rings represent the story of love between two people. Your diamond ring is placed on the third finger on the hand, as it has been held associated with passion as a vein running through the finger leads directly to the heart. Every aspect of these rings that brides-to-be wear, including the metal, diamond cut, color and clarity elaborately contribute to shape the overall aesthetics of the ring. For engagement rings, the round diamond shape is chosen most often as it allows light to shine within the stone’s entire circumference. However, any shape of diamond including princess, pear, or oval cut stones shine with a brilliance that help make these bands one to be remembered forever. Love has endless forms of expressions, some of which are evident in the Seasons of Love collection by A. Jaffe. This A. Jaffe line includes a variety of solitaire style rings. 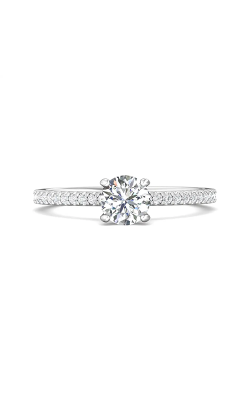 Each solitaire’s single or double engagement band is polished to perfection. Alternative styles include halo rings with carefully crafted accent details with side stones set in each side of the bands. This engagement ring collection is recognized for its fusion of heirloom and modern qualities, making new memories and celebrating the new journey you are about to take. We also carry our own brand of diamond rings here at David Hayman Jewellers. This line features sophisticated halo style heirloom rings with center diamond shapes often accented with emeralds or other gemstones. Every engagement ring setting provides its own unique portrayal of love on the day you pop the big question. We customize all engagement rings with the perfect balance between diamond brilliance and gold or platinum shine. Every feature, including band thickness and stone size, is tailored to accentuate the shape of a future bride's hand. Explore our selection of diamond rings, with exceptional diamonds that dance along the band and elevate your proposal. Why Shop for Diamond Rings at David Hayman Jewellers? Come see what we have at our Yorba Linda, California showroom made by A. Jaffe and our personal brand, plus additional designers including Le Vian or CrownRing. We also serve nearby locations such as Placentia, Anaheim, Brea and Fullerton. Jewelry styles we offer besides engagement rings and wedding bands include earrings, brooches, lavaliers and other accent jewelry. Services offered by David Hayman Jewellers include cleaning, inspection and repair as well as estimates and free two-day shipping on orders $300 or more. Call us at 714-996-9032 for more information or visit us online at DavidHaymanJewellers.com.